¶ 3 Leave a comment on paragraph 3 0 Perhaps no decade is so immortalized in American memory as the 1960s. Couched in the colorful rhetoric of peace and love, complemented by stirring images of the civil rights movement, and fondly remembered for its music, art, and activism, for many the decade brought hopes for a more inclusive, forward-thinking nation. But the decade was also plagued by strife, tragedy, and chaos. It was the decade of the Vietnam War, of inner-city riots, and assassinations that seemed to symbolize the crushing of a new generation’s idealism. A decade of struggle and disillusionment rocked by social, cultural, and political upheaval, the 1960s are remembered because so much changed, and because so much did not. ¶ 5 Leave a comment on paragraph 5 0 The decade’s political landscape began with a watershed presidential election. Americans were captivated by the 1960 race between Republican Vice President Richard Nixon and Democratic Senator John F. Kennedy, two candidates who pledged to move the nation forward and invigorate an economy experiencing the worst recession since the Great Depression. Kennedy promised to use federal programs to strengthen the economy and address pockets of longstanding poverty, while Nixon called for a reliance on private enterprise and reduction of government spending. Both candidates faced criticism as well; Nixon had to defend Dwight Eisenhower’s domestic policies, while Kennedy, who was attempting to become the first Catholic president, had to counteract questions about his faith and convince voters that he was experienced enough to lead. ¶ 6 Leave a comment on paragraph 6 0 One of the most notable events of the Nixon-Kennedy presidential campaign was their televised debate in September, the first of its kind between major presidential candidates. The debate focused on domestic policy and provided Kennedy with an important moment to present himself as a composed, knowledgeable statesman. In contrast, Nixon, an experienced debater who faced higher expectations, looked sweaty and defensive. Radio listeners famously thought the two men performed equally well, but the TV audience was much more impressed by Kennedy, giving him an advantage in subsequent debates. Ultimately, the election was extraordinarily close; in the largest voter turnout in American history up to that point, Kennedy bested Nixon by less than one percentage point (34,227,096 to 34,107,646 votes). Although Kennedy’s lead in electoral votes was more comfortable at 303 to 219, the Democratic Party’s victory did not translate in Congress, where Democrats lost a few seats in both houses. As a result, Kennedy entered office in 1961 without the mandate necessary to achieve the ambitious agenda he would refer to as the New Frontier. ¶ 7 Leave a comment on paragraph 7 0 The United States entered the 1960s unaccustomed to stark foreign policy failures, having emerged from World War II as a global superpower before waging a Cold War against the Soviet Union in the 1950s. In the new decade, unsuccessful conflicts in Cuba and Vietnam would yield embarrassment, fear, and tragedy, stunning a nation used to triumph and altering the way many thought of America’s role in international affairs. ¶ 8 Leave a comment on paragraph 8 0 On January 8, 1959, Fidel Castro and his revolutionary army initiated a new era of Cuban history. Having ousted the corrupt Cuban President Fulgenico Batista, who had fled Havana on New Year’s Eve, Castro and his rebel forces made their way triumphantly through the capital city’s streets. The United States, who had long propped up the Batista’s corrupt regime, had withdrawn support and, initially, expressed sympathy for Castro’s new government, which was immediately granted diplomatic recognition. But President Dwight Eisenhower and members of his administration were wary. The new Cuban government soon instituted leftist economic policies centered around agrarian reform, land redistribution, and the nationalization of private enterprises. Cuba’s wealthy and middle class citizens fled the island in droves. Many settled in Miami, Florida, and other American cities. ¶ 9 Leave a comment on paragraph 9 0 The relationship between Cuba and the United States deteriorated rapidly. On October 19, 1960, the United States instituted a near-total trade embargo to economically isolate the Cuban regime, and, in January 1961, the two nations broke off formal diplomatic relations. The Central Intelligence Agency, acting under the mistaken belief that the Castro government lacked popular support and that Cuban citizens would revolt if given the opportunity, began to recruit members of the exile community to participate in an invasion of the island. On April 16, 1961, an invasion force consisting primarily of Cuban émigrés landed on Girón Beach at the Bay of Pigs. Cuban soldiers and civilians quickly overwhelmed the exiles, many of whom were taken prisoner. The Cuban government’s success at thwarting the Bay of Pigs invasion did much to legitimize the new regime and was a tremendous embarrassment for the Kennedy administration. ¶ 10 Leave a comment on paragraph 10 0 As the political relationship between Cuba and the United States disintegrated, the Castro government became more closely aligned with the Soviet Union. This strengthening of ties set the stage for the Cuban Missile Crisis, perhaps the most dramatic foreign policy crisis in the history of the United States. In 1962, in response to the US’s long-time maintenance of a nuclear arsenal in Turkey and at the invitation of the Cuban government, the Soviet Union deployed nuclear missiles in Cuba. On October 14, 1962, American spy planes detected the construction of missile launch sites, and on October 22, President Kennedy addressed the American people to alert them to this threat. Over the course of the next several days, the world watched in horror as the United States and the Soviet Union hovered on the brink of nuclear war. Finally, on October 28, the Soviet Union agreed to remove its missiles from Cuba in exchange for a U.S. agreement to remove its missiles from Turkey and a formal pledge that the United States would not invade Cuba, and the crisis was resolved peacefully. ¶ 11 Leave a comment on paragraph 11 0 The Cuban Missile Crisis was a time of great fear throughout America. 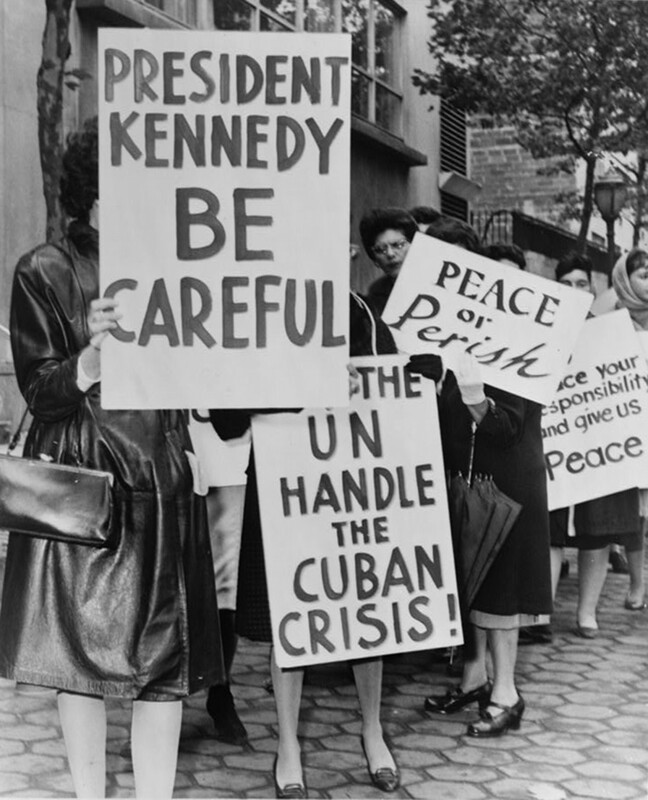 Women in this photograph urged President Kennedy to be cautious of instigating war. Phil Stanziola, “800 women strikers for peace on 47 St near the UN Bldg,” 1962. Library of Congress. ¶ 12 Leave a comment on paragraph 12 0 Though the Cuban Missile Crisis temporarily halted the flow of Cuban refugees into the United States, emigration began again in earnest in the mid-1960s. In 1965, the Johnson administration and the Castro government brokered a deal that facilitated the reunion of families that had been separated by earlier waves of migration, opening the door for thousands to leave the island. In 1966 President Lyndon B. Johnson signed the Cuban Adjustment Act, a law allowing Cuban refugees to become permanent residents. Over the course of the 1960s, hundreds of thousands of Cubans left their homeland and built new lives in America. ¶ 24 Leave a comment on paragraph 24 0 Images of police brutality against peaceful Civil Rights demonstrators shocked many Americans and helped increase support for the movement. Photograph by Bill Hudson. Birmingham, Alabama. 1964. Source. ¶ 26 Leave a comment on paragraph 26 1 As governor, Wallace loudly supported segregation. His efforts were symbolic, but they earned him national recognition as a political figure willing to fight for what many southerners saw as their traditional way of life. 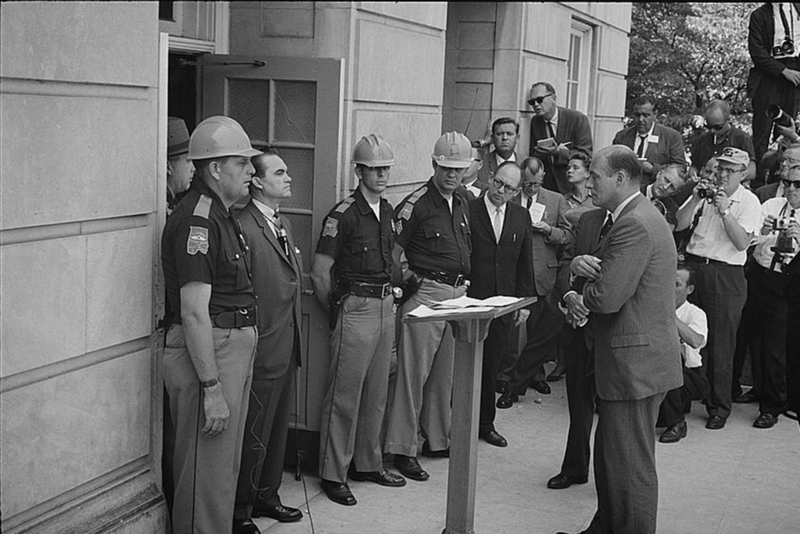 In June 1963, just five months after becoming governor, in his “Stand in the Schoolhouse Door,” Wallace famously stood in the door of a classroom building to protest integration at the University of Alabama. President Kennedy addressed the nation that evening, criticizing Wallace and calling for a comprehensive civil rights bill. A day later, civil rights leader Medgar Evers was assassinated at his home in Jackson, Mississippi. ¶ 31 Leave a comment on paragraph 31 0 White activists increasingly joined African Americans in the Civil Rights Movement during the 1960s. This photograph shows Martin Luther King, Jr., and other black civil rights leaders arm-in-arm with leaders of the Jewish community. Photograph, August 28, 1963. 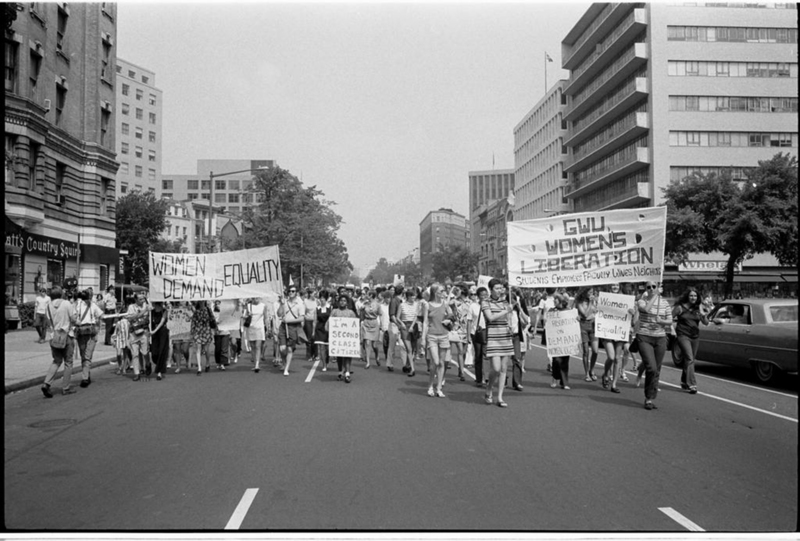 Wikimedia, http://commons.wikimedia.org/wiki/File:March_on_washington_Aug_28_1963.jpg. ¶ 32 Leave a comment on paragraph 32 0 Kennedy offered support for a civil rights bill, but, unable to push past southern resistance and unwilling to expend too much political capital, the bill stalled in Congress. Then, on November 22, 1963, President Kennedy was assassinated in Dallas. The nation’s youthful, popular president was gone. Vice President Lyndon Johnson lacked Kennedy’s youth, his charisma, his popularity, and his aristocratic upbringing, but no one knew Washington better and no one before or since fought harder and more successfully to pass meaningful civil rights legislation. Raised in poverty in the Texas Hill Country, Johnson scratched and clawed his way up the political ladder. He was both ruthlessly ambitious and keenly conscious of poverty and injustice. He idolized Franklin Roosevelt, for instance, whose New Deal had brought improvements for the impoverished Central Texans Johnson grew up with. ¶ 33 Leave a comment on paragraph 33 0 President Lyndon Johnson, then, an old white southerner with a thick Texas drawl, embraced the civil rights movement. He took Kennedy’s stalled civil rights bill, ensured that it would have teeth, and navigated it through Congress. The following summer he signed the Civil Rights Act of 1964, widely considered to be among the most important pieces of civil rights legislation in American history. The comprehensive act barred segregation in public accommodations and outlawed discrimination based on race, ethnicity, gender, and national or religious origin. ¶ 34 Leave a comment on paragraph 34 0 Lyndon B. Johnson sits with Civil Rights Leaders in the White House. 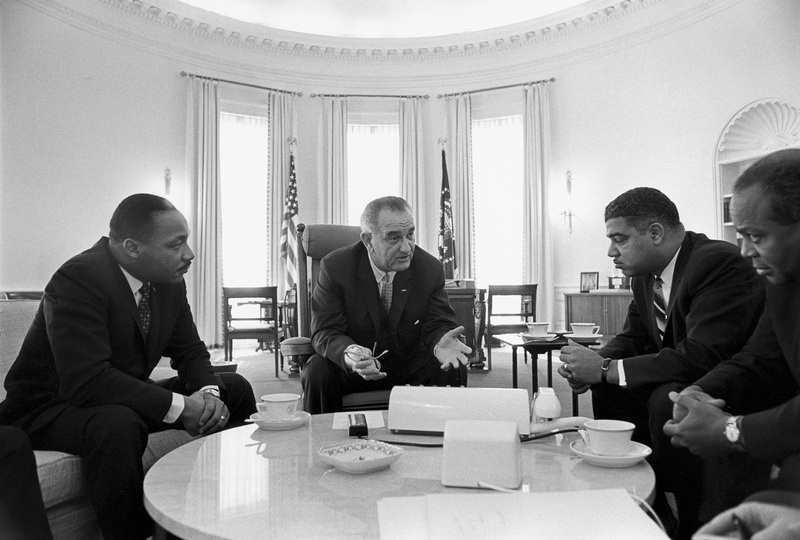 One of Johnson’s greatest legacies would be his staunch support of civil rights legislation. Photograph, January 18, 1964. Wikimedia. ¶ 35 Leave a comment on paragraph 35 0 Johnson gives Senator Richard Russell the famous “Johnson Treatment.” Yoichi R. Okamoto, Photograph of Lyndon B. Johnson pressuring Senator Richard Russell, December 17, 1963. Wikimedia. ¶ 38 Leave a comment on paragraph 38 0 Five leaders of the Civil Rights Movement. 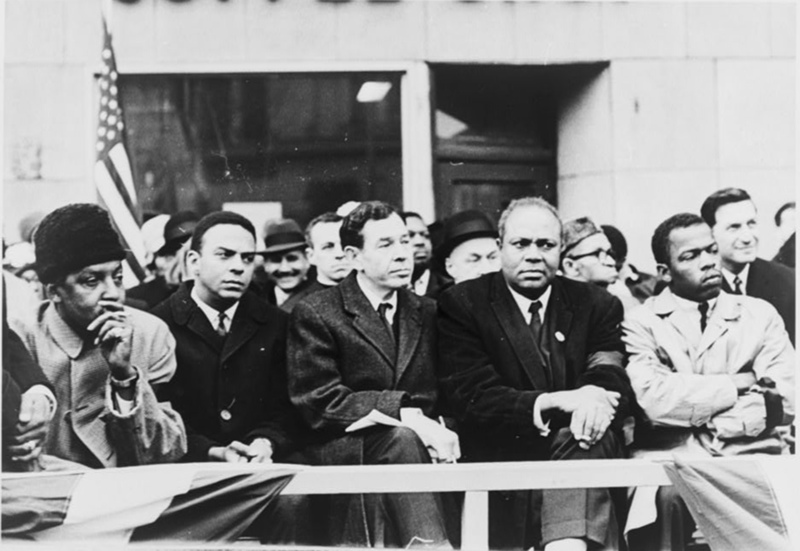 From left: Bayard Rustin, Andrew Young, N.Y. Congressman William Ryan, James Farmer, and John Lewis in 1965. Stanley Wolfson, Photograph, 1965. Library of Congress, http://www.loc.gov/pictures/item/98515229/. ¶ 41 Leave a comment on paragraph 41 0 The Great Society’s legislation was breathtaking in scope, and many of its programs and agencies are still with us today. 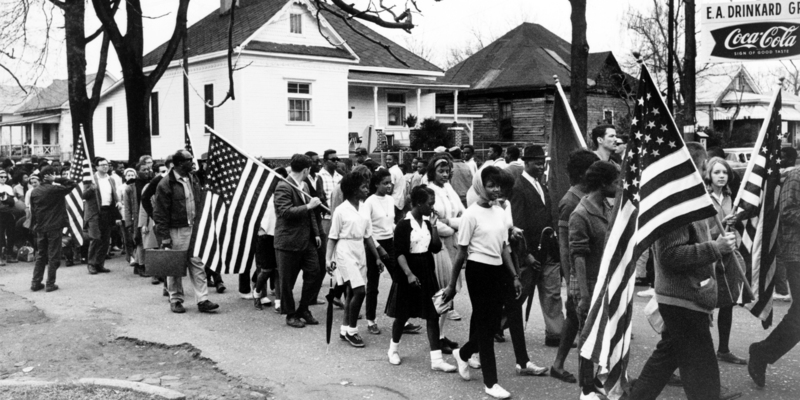 Most importantly, the Civil Rights Act of 1964 and the Voting Rights Act of 1965 codified federal support for many of the civil rights movement’s goals by prohibiting job discrimination, abolishing the segregation of public accommodations, and providing vigorous federal oversight of southern states’ primary and general election laws in order to guarantee minority access to the ballot. Ninety years after Reconstruction, these measures effectively ended Jim Crow. ¶ 42 Leave a comment on paragraph 42 1 In addition to civil rights, the Great Society took on a range of quality of life concerns that seemed suddenly solvable in a society of such affluence. It established the first federal Food Stamp Program. Medicare and Medicaid would ensure access to quality medical care for the aged and poor. In 1965, the Elementary and Secondary Education Act was the first sustained and significant federal investment in public education, totaling more than $1 billion. Significant funds were poured into colleges and universities. The Great Society also established the National Endowment for the Arts and the National Endowment for the Humanities, federal investments in arts and letters that fund American cultural expression to this day. ¶ 44 Leave a comment on paragraph 44 0 In fact, Johnson himself had never conceived of poor Americans running their own poverty programs. While the president’s rhetoric offered a stirring vision of the future, he had singularly old-school notions for how his poverty policies would work. In contrast to “maximum feasible participation,” the President imagined a second New Deal: local elite-run public works camps that would instill masculine virtues in unemployed young men. 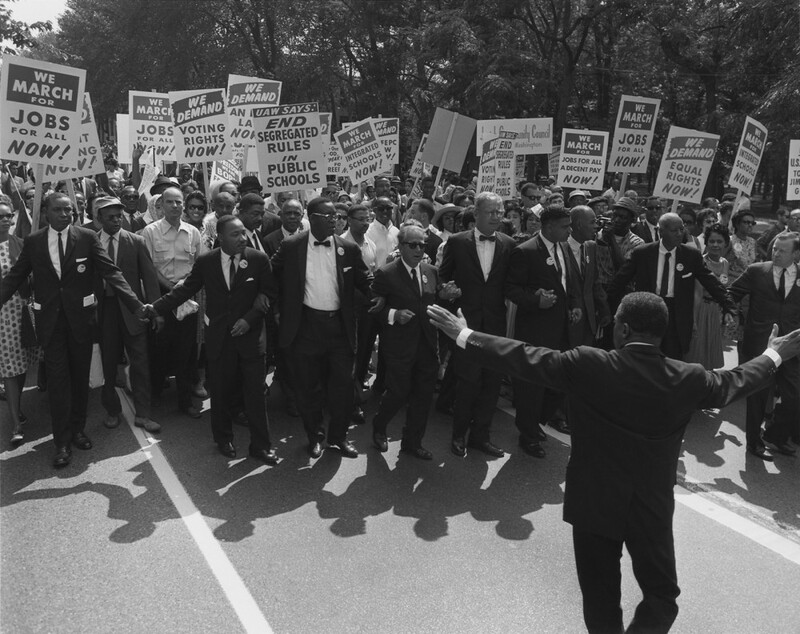 Community Action almost entirely bypassed local administrations and sought to build grassroots civil rights and community advocacy organizations, many of which had originated in the broader civil rights movement. Despite widespread support for most Great Society programs, the War on Poverty increasingly became the focal point of domestic criticisms from the left and right. On the left, frustrated liberals recognized the president’s resistance to empowering minority poor and also assailed the growing war in Vietnam, the cost of which undercut domestic poverty spending. As racial unrest and violence swept across urban centers, critics from the right lambasted federal spending for “unworthy” and even criminal citizens. ¶ 48 Leave a comment on paragraph 48 0 American involvement in the Vietnam War began during the postwar period of decolonization. The Soviet Union backed many nationalist movements across the globe, but the United States feared the expansion of communist influence and pledged to confront any revolutions aligned against western capitalism. The “domino theory”—the idea that if a country fell to communism, then neighboring states would soon follow—governed American foreign policy. After the communist takeover of China in 1949, the United States financially supported the French military’s effort to retain control over its colonies in Vietnam, Cambodia and Laos. ¶ 49 Leave a comment on paragraph 49 0 Between 1946 and 1954, France fought a counterinsurgency campaign against the nationalist Viet Minh forces led by Ho Chi Minh. The United States assisted the French war effort with funds, arms, and advisors, but it was not enough. On the eve of the Geneva Peace Conference in 1954, Viet Minh forces defeated the French army at Dien Bien Phu. The conference temporarily divided Vietnam into two separate states until United Nations-monitored elections occurred. But the U.S. feared a communist electoral victory and so blocked the elections. The temporary partition became permanent. The U.S. established the Republic of Vietnam, or South Vietnam, with the US-backed Ngo Dinh Diem as prime minister. Although he was a nationalist, Diem, who had lived in the United States, was a committed anti-communist. ¶ 51 Leave a comment on paragraph 51 0 This all changed in 1964. On August 2, the USS Maddox reported incoming fire from North Vietnamese ships in the Gulf of Tonkin. Although the details of the incident are controversial, the Johnson administration exploited the incident to provide a pretext for escalating American involvement in Vietnam. Congress passed the Gulf of Tonkin Resolution, granting President Johnson the authority to deploy the American military to defend South Vietnam. U.S. Marines landed in Vietnam in March, 1965, and the American ground war began. ¶ 52 Leave a comment on paragraph 52 0 American forces under General William Westmoreland were tasked with defending South Vietnam against the insurgent Vietcong (VC) and the regular North Vietnamese Army (NVA). But no matter how many troops the Americans sent, or how many bombs they dropped, they could not win. This was a different kind of war. Progress was not measured by cities won or territory taken, but by body counts and kill-ratios. Although American officials like Westmoreland and Secretary of Defense Robert McNamara claimed a communist defeat was on the horizon, by 1968 half-a-million American troops were stationed in Vietnam, nearly 20,000 had been killed, and the war was still no closer to being won. Protests, which would provide the backdrop for the American counterculture, erupted across the country. 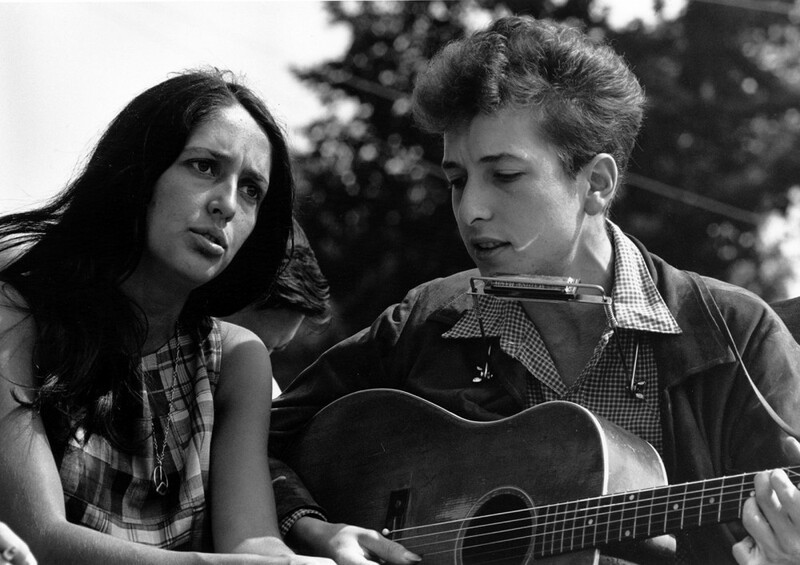 ¶ 54 Leave a comment on paragraph 54 0 Epitomizing the folk music and protest culture of 1960s youth, Joan Baez and Bob Dylan are pictured here singing together at the March on Washington in 1963. Photograph, Wikimedia. ¶ 55 Leave a comment on paragraph 55 0 The 1960s wrought enormous cultural change. The United States that entered the decade looked and sounded little like the one that left it. Rebellion rocked the supposedly hidebound conservatism of the 1950s as the youth counterculture became mainstream. Native Americans, Chicanos, women, and environmentalists participated in movements demonstrating that “rights” activism could be applied to ethnicity, gender, and nature. Even established religious institutions such as the Catholic Church underwent transformations reflecting an emerging emphasis on freedom and tolerance. In each instance, the decade brought about substantial progress with a reminder that the activism in each cultural realm remained fluid and unfinished. 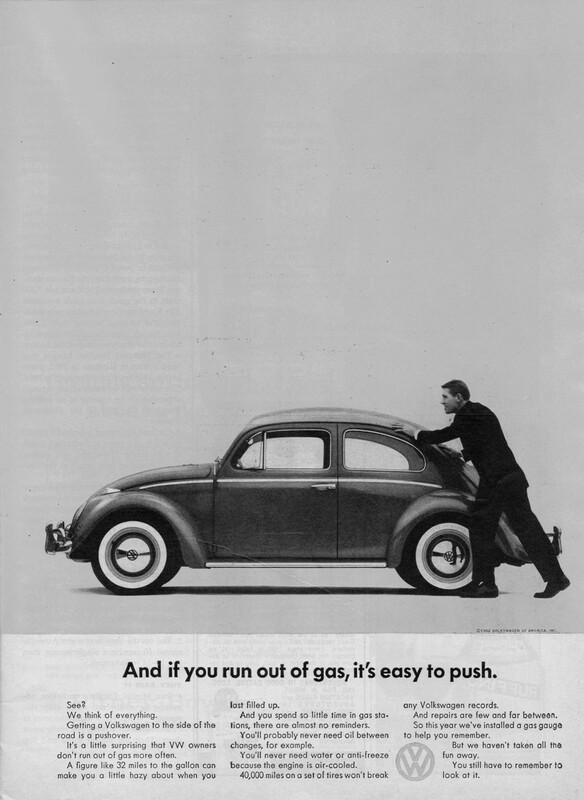 ¶ 57 Leave a comment on paragraph 57 0 The Volkswagen Beetle became an icon of 1960s culture and a paradigm of a new advertising age. This tongue-in-cheek advertisement attracted laughs and attention from the public and business world. http://www.videosurrey.com/wp-content/uploads/2013/03/beetle-coccinelle-volkswagen-vw-publicite-vintage-03.jpg. ¶ 59 Leave a comment on paragraph 59 0 But it wasn’t just advertising: the culture was changing and changing rapidly. Conservative cultural norms were falling everywhere. The dominant style of women’s fashion in the 1950s, for instance, was the poodle skirt and the sweater, tight-waisted and buttoned up. The 1960s ushered in an era of much less restrictive clothing. Capri pants became popular casual wear. Skirts became shorter. When Mary Quant invented the miniskirt in 1964, she said it was a garment “in which you could move, in which you could run and jump.” ((Brenda Polan and Roger Tredre, The Great Fashion Designers (New York: Berg, 2009), 103-104.)) By the late 1960s, the hippies’ more androgynous look became trendy. Such trends bespoke the new popular ethos of the 1960s: freedom, rebellion, and individuality. ¶ 60 Leave a comment on paragraph 60 0 Fashion can sometimes capture a generation’s world view. Miniskirts – one of the most radical and popular fashions of the 1960s – demonstrated the new sexual openness of young women. 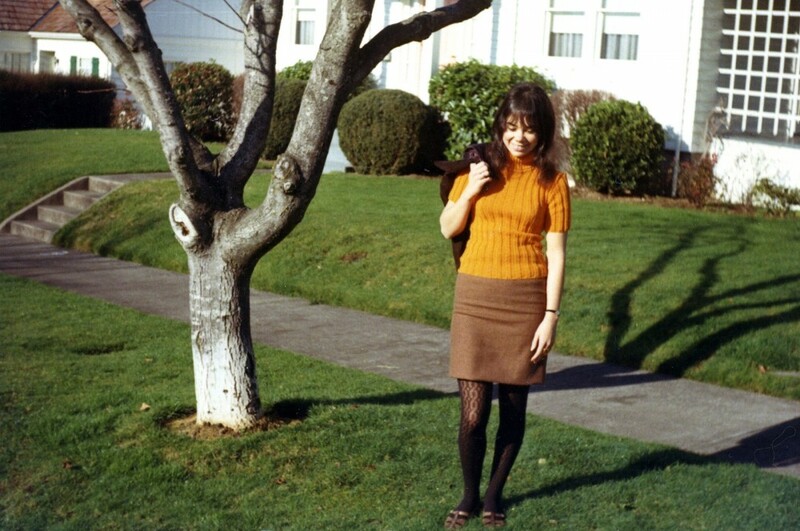 Photograph of young woman in Eugene, Oregon, 1966. Wikimedia, http://commons.wikimedia.org/wiki/File:1960s_fashions_(1709303069).jpg. ¶ 62 Leave a comment on paragraph 62 0 The counterculture conquered popular culture. Rock ‘n’ roll, liberalized sexuality, an embrace of diversity, recreational drug use, unalloyed idealism, and pure earnestness marked a new generation. Criticized by conservatives as culturally dangerous and by leftists as empty narcissism, the youth culture nevertheless dominated headlines and steered American culture. Perhaps 100,000 youth descended on San Francisco for the utopic promise of 1967’s Summer of Love. 1969’s Woodstock concert became shorthand for the new youth culture and its mixture of politics, protest, and personal fulfillment. While the ascendance of the hippies would be both exaggerated and short-lived, and while Vietnam and Richard Nixon shattered much of its idealism, the counterculture’s liberated social norms and its embrace of personal fulfillment still define much of American culture. ¶ 65 Leave a comment on paragraph 65 0 Like Booker T. Washington and W.E.B. Du Bois before them, Martin Luther King, Jr., and Malcolm X represented two styles of racial uplift while maintaining the same general goal of ending racial discrimination. How they would get to that goal is where the men diverged. 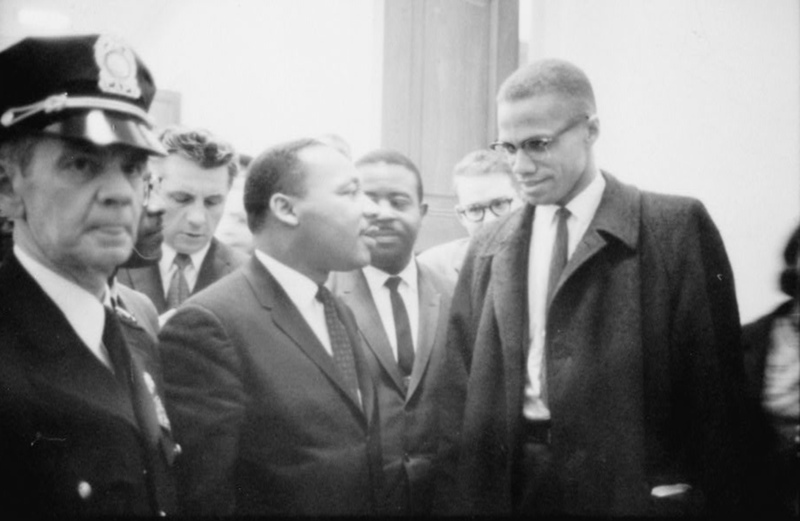 Marion S. Trikosko, “[Martin Luther King and Malcolm X waiting for press conference],” March 26, 1964. 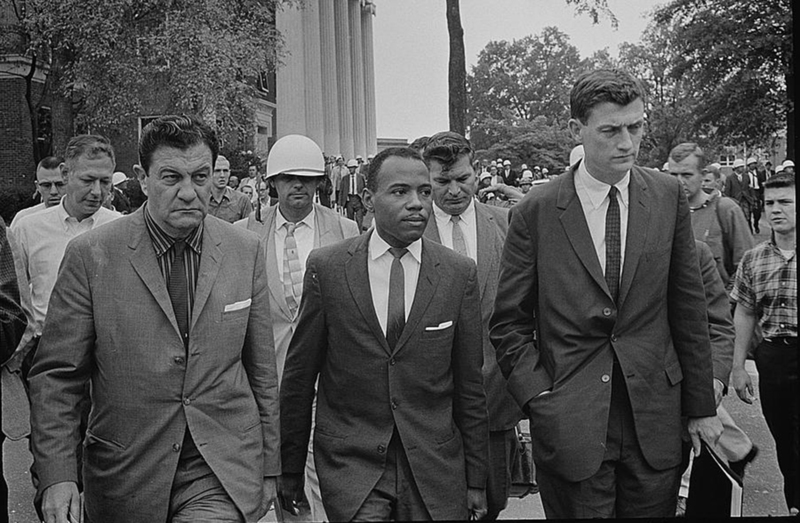 Library of Congress, http://www.loc.gov/pictures/item/92522562/.By the late 1960s, the Student Nonviolent Coordinating Committee (SNCC), led by figures such as Stokely Carmichael, had expelled its white members and shunned the interracial effort in the rural South, focusing instead on injustices in northern urban areas. After President Johnson refused to take up the cause of the black delegates in the Mississippi Freedom Democratic Party at the 1964 Democratic National Convention, SNCC activists became frustrated with institutional tactics and turned away from the organization’s founding principle of nonviolence over the course of the next year. This evolving, more aggressive movement called for African Americans to play a dominant role in cultivating black institutions and articulating black interests rather than relying on interracial, moderate approaches. At a June 1966 civil rights march, Carmichael told the crowd, “What we gonna start saying now is black power!” ((Peniel E. Joseph, editor, The Black Power Movement: Rethinking the Civil Rights-Black Power Era (New York: Routledge, 2013), 2.)) 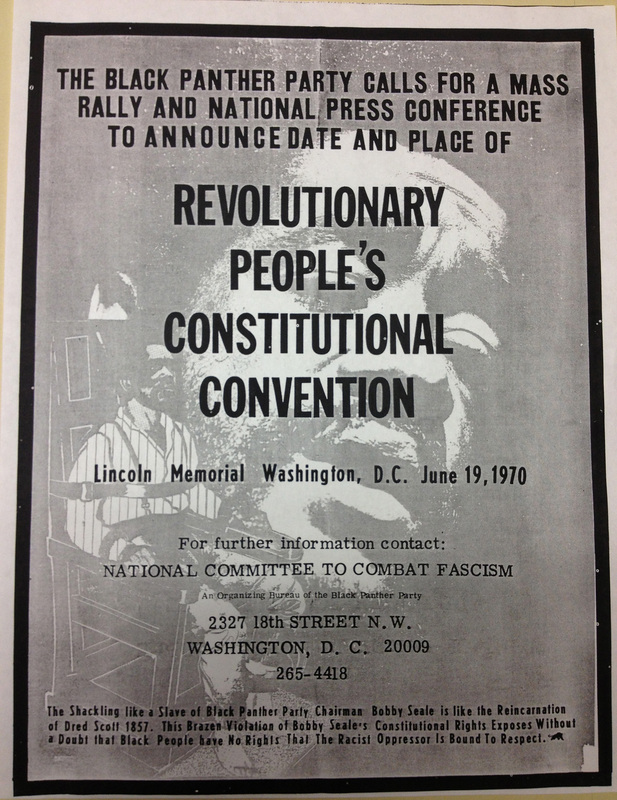 The slogan not only resonated with audiences, it also stood in direct contrast to King’s “Freedom Now!” campaign. The political slogan of black power could encompass many meanings, but at its core stood for the self-determination of blacks in political, economic, and social organizations. ¶ 69 Leave a comment on paragraph 69 0 The Black Panther Party used radical and incendiary tactics to bring attention to the continued oppression of blacks in America. Read the bottom paragraph on this rally poster carefully. Wikimedia. ¶ 74 Leave a comment on paragraph 74 1 Cesar Chavez became the most well-known figure of the Chicano movement, using nonviolent tactics to campaign for workers’ rights in the grape fields of California. Chavez and activist Dolores Huerta founded the National Farm Workers Association, which eventually merged and became the United Farm Workers of America (UFWA). 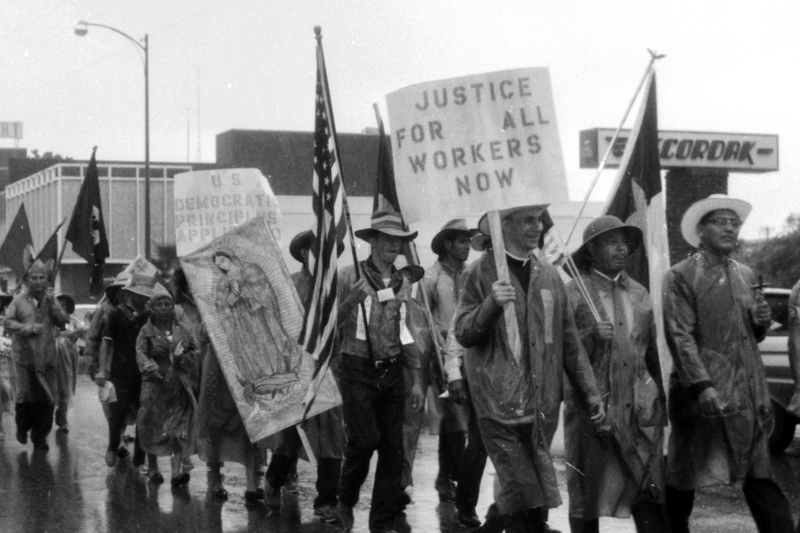 The UFWA fused the causes of Chicano and Filipino activists protesting subpar working conditions of California farmers on American soil. In addition to embarking on a hunger strike and a boycott of table grapes, Chavez led a 300-mile march in March and April of 1966 from Delano, California to the state capital of Sacramento. The pro-labor campaign garnered the national spotlight and the support of prominent political figures such as Robert Kennedy. Today, Chavez’s birthday (March 31) is observed as a federal holiday in California, Colorado, and Texas. ¶ 75 Leave a comment on paragraph 75 0 The United Farm Workers Union become a strong force for bettering working conditions of laborers in California and Florida agriculture. 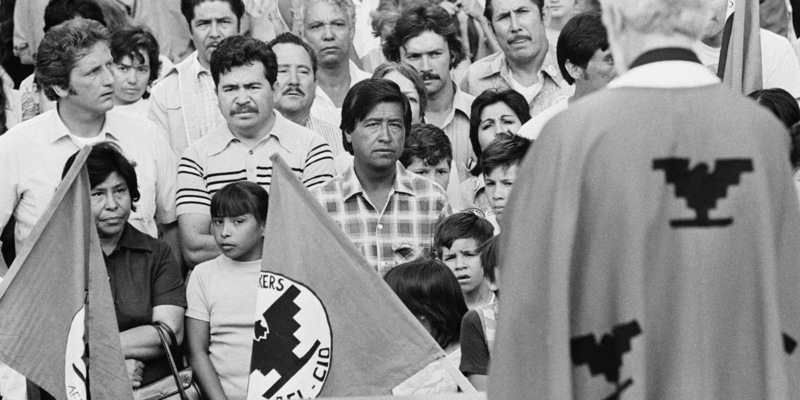 Cesar Chavez (center) and UFW supporters attend an outdoor Mass on the capitol steps in Sacramento, Calif., before start of a labor protest march, date unknown. Huffington Post. ¶ 78 Leave a comment on paragraph 78 0 The feminist movement also made great strides in the 1960s. Women were active in both the civil rights movement and the labor movement, but their increasing awareness of gender inequality did not find a receptive audience among male leaders in those movements. In the 1960s, then, many of these women began to form a movement of their own. Soon the country experienced a groundswell of feminist consciousness. ¶ 81 Leave a comment on paragraph 81 0 The 1960s also saw a different group of women pushing for change in government policy. Welfare mothers began to form local advocacy groups in addition to the National Welfare Rights Organization founded in 1966. Mostly African American, these activists fought for greater benefits and more control over welfare policy and implementation. Women like Johnnie Tillmon successfully advocated for larger grants for school clothes and household equipment in addition to gaining due process and fair administrative hearings prior to termination of welfare entitlements. ¶ 82 Leave a comment on paragraph 82 0 Yet another mode of feminist activism was the formation of consciousness-raising groups. These groups met in women’s homes and at women’s centers, providing a safe environment for women to discuss everything from experiences of gender discrimination to pregnancy, from relationships with men and women to self-image. The goal of consciousness-raising was to increase self-awareness and validate the experiences of women. Groups framed such individual experiences as examples of society-wide sexism, and claimed that “the personal is political.” ((Carol Hanisch, “The Personal is Political,” in Shulamith Firestone and Anne Koedt, editors, Notes from the Second Year: Women’s Liberation (New York: Radical Feminism, 1970).)) Consciousness-raising groups created a wealth of personal stories that feminists could use in other forms of activism and crafted networks of women that activists could mobilize support for protests. ¶ 83 Leave a comment on paragraph 83 0 The end of the decade was marked by the Women’s Strike for Equality celebrating the 50th anniversary of women’s right to vote. Sponsored by NOW (the National Organization for Women), the 1970 protest focused on employment discrimination, political equality, abortion, free childcare, and equality in marriage. All of these issues foreshadowed the backlash against feminist goals in the 1970s. Not only would feminism face opposition from other women who valued the traditional homemaker role to which feminists objected, the feminist movement would also fracture internally as minority women challenged white feminists’ racism and lesbians vied for more prominence within feminist organizations. ¶ 84 Leave a comment on paragraph 84 0 The women’s movement stagnated after gaining the vote in 1920, but by the 1960s it was back in full force. Inspired by the Civil Rights Movement and fed up with gender discrimination, women took to the streets to demand their rights as American citizens. Warren K. Leffler, “Women’s lib[eration] march from Farrugut Sq[uare] to Layfette [i.e., Lafayette] P[ar]k,” August 26, 1970. Library of Congress, http://www.loc.gov/pictures/item/2003673992/.American environmentalism’s significant gains during the 1960s emerged in part from Americans’ recreational use of nature. Postwar Americans backpacked, went to the beach, fished, and joined birding organizations in greater numbers than ever before. These experiences, along with increased formal education, made Americans more aware of threats to the environment and, consequently, to themselves. Many of these threats increased in the post-war years as developers bulldozed open space for suburbs and new hazards from industrial and nuclear pollutants loomed. ¶ 89 Leave a comment on paragraph 89 0 After Silent Spring, the social and intellectual currents of environmentalism continued to expand rapidly, culminating in the largest demonstration in history, Earth Day, on April 22, 1970, and in a decade of lawmaking that significantly restructured American government. Even before the massive gathering for Earth Day, lawmakers from the local to federal level had pushed for and achieved regulations to clean up the air and water. President Richard Nixon signed the National Environmental Policy Act into law in 1970, requiring environmental impact statements for any project directed or funded by the federal government. He also created the Environmental Protection Agency, the first agency charged with studying, regulating, and disseminating knowledge about the environment. A raft of laws followed that were designed to offer increased protection for air, water, endangered species, and natural areas. ¶ 90 Leave a comment on paragraph 90 0 The decade’s activism worked all across society. It even affected the Catholic Church. The Second Vatican Council, called by Pope John XXIII to modernize the church and bring it in closer dialogue with the non-Catholic world, operated from 1962 to 1965, when it proclaimed multiple reforms, including the “vernacular mass” (or, mass in local languages, rather than in Latin) and a greater role for laypeople, and especially women, in the Church. Many Catholic churches adopted more informal, contemporary styles. Many conservative Catholics recoiled at what they perceived as rapid and dangerous changes, but Vatican II’s reforms in many ways created the modern Catholic Church. ¶ 91 Leave a comment on paragraph 91 0 Losing membership and influence throughout the world, leaders of the Catholic Church met in 1965 institute new measures to modernize and open the church. This ecumenical council would become known as the Second Vatican Council or Vatican II. 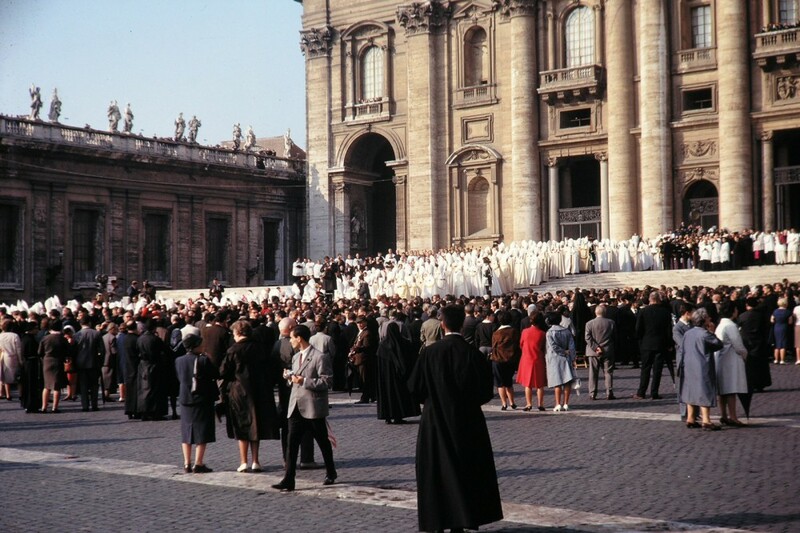 Photograph of the grand procession of the Council Fathers at St. Peter’s Basilica, October 11, 1962. Wikimedia. ¶ 93 Leave a comment on paragraph 93 0 In 1969, Americans hailed the moon landing as a profound victory in the “space race” against the Soviet Union that fulfilled the promise of the late John F. Kennedy, who had declared in 1961 that the U.S. would put a man on the moon by the end of the decade. But while Neil Armstrong said his steps marked “one giant leap for mankind,” and Americans marveled at the achievement, the brief moment of wonder only punctuated years of turmoil. The Vietnam War disillusioned a generation, riots rocked cities, protests hit campuses, and assassinations robbed the nation of many of its leaders. The forward-thinking spirit of a complex decade had waned. Uncertainty loomed. ¶ 95 Leave a comment on paragraph 95 0 This chapter was edited by Samuel Abramson, with content contributions by Samuel Abramson, Marsha Barrett, Brent Cebul, Michell Chresfield, William Cossen, Jenifer Dodd, Michael Falcone, Leif Fredrickson, Jean-Paul de Guzman, Jordan Hill, William Kelly, Lucie Kyrova, Maria Montalvo, Emily Prifogle, Ansley Quiros, Tanya Roth, and Robert Thompson. Recommended citation: Samuel Abramson et al., “The Sixties,” Samuel Abramson, ed., in The American Yawp, Joseph Locke and Ben Wright, eds., last modified August 1, 2016, http://www.AmericanYawp.com. Breines, Winifred. The Trouble Between Us: An Uneasy History of White and Black Women in the Feminist Movement. New York: Oxford University Press, 2006. Branch, Taylor. Parting the Waters: America in the King Years, 1954–1963. New York: Simon & Schuster, 1988. Branch, Taylor. Pillar of Fire: America in the King Years, 1963-65. New York: Simon & Schuster, 1998. Brick, Howard. The Age of Contradictions: American Thought and Culture in the 1960s. Ithaca: Cornell University Press, 2000. Carson, Clayborne. In Struggle: SNCC and the Black Awakening of the 1960s. Cambridge: Harvard University Press, 1981. Chafe, William. Civilities and Civil Rights: Greensboro, North Carolina, and the Black Struggle for Freedom. New York: Oxford University Press, 1980. D’Emilio, John. Sexual Politics, Sexual Communities: The Making of a Homosexual Minority in the United States, 1940-1970. Chicago: University of Chicago Press, 1983. Dallek, Robert. 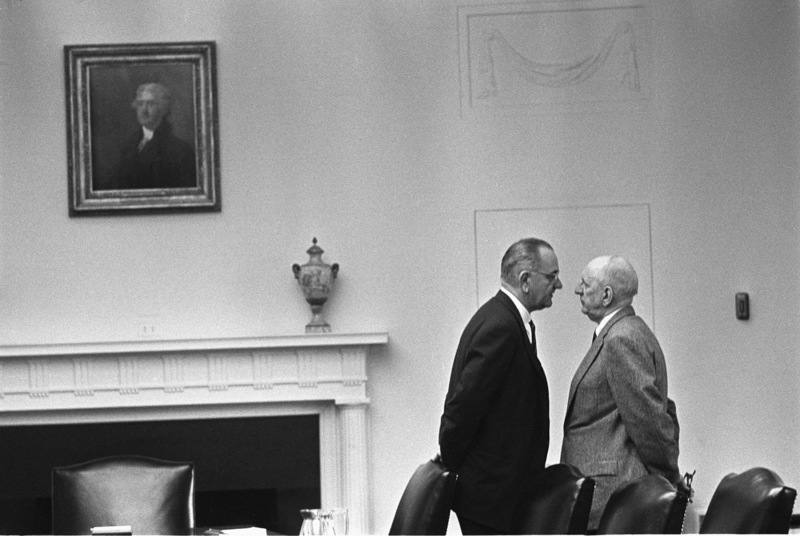 Flawed Giant: Lyndon Johnson and His Times, 1961-1973. New York: Oxford University Press, 1993. Hall, Jacquelyn Dowd. “The Long Civil Rights Movement and the Political Uses of the Past,” Journal of American History 91 (March 2005): 1233-1263. Isserman, Maurice. If I Had a Hammer: The Death of the Old Left and the Birth of the New Left. Champaign: University of Illinois Press, 1987. 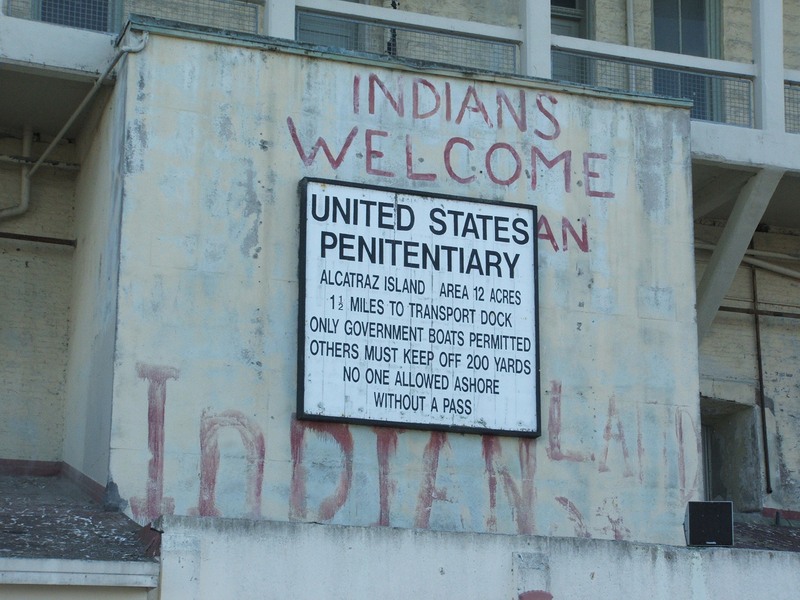 Johnson, Troy R. The American Indian Occupation of Alcatraz Island: Red Power and Self-Determination. Lincoln: University of Nebraska Press, 2008. Joseph, Peniel. Waiting ‘til the Midnight Hour: A Narrative History of Black Power in America. New York: Holt, 2006. Kazin, Michael, and Isserman, Maurice. 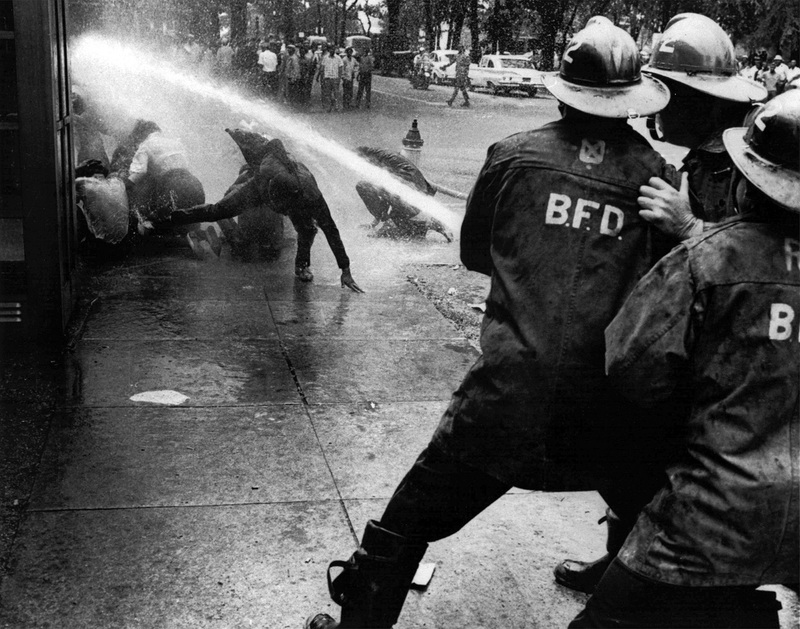 America Divided: The Civil War of the 1960s. New York: Oxford University Press, 2007. Orleck, Annelise. Storming Caesar’s Palace: How Black Mothers Fought Their Own War on Poverty. New York: Beacon Press, 2005. Patterson, James T. America’s Struggle Against Poverty in the Twentieth Century. Harvard University Press, 1981. Perlstein, Rick. Before the Storm : Barry Goldwater and the Unmaking of the American Consensus. New York: Hill & Wang, 2001. Ransby, Barbara. Ella Baker and the Black Freedom Movement: A Radical Democratic Vision. Chapel Hill: The University of North Carolina Press, 2000. Robnett, Belinda. How Long? How Long? : African American Women in the Struggle for Civil Rights. New York: Oxford University Press, 2000. Sugrue, Thomas, The Origins of the Urban Crisis: Race and Inequality in Postwar Detroit. Princeton, NJ: Princeton University Press, 2005.